We established how much I love rainbows last week, so there's no need for me to explain why I had to have this Forever 21 dress! :-) You guys also know that I am a frequent Forever 21 shopper, but it can be an overwhelming and frustrating store to shop at, so I though I'd share my tips and secrets for finding the best deals! 1. Shop online first. Shopping at a Forever 21 store can be soooo overwhelming. Shopping online can be frustrating because items don't always fit like the picture. Do what I do: shop online, then head to the store to check things out in person. This will help you navigate your way through the store and find things you like, but it will also help you avoid buying a bunch of stuff that doesn't look great in person. 2. Check new arrivals daily. The other frustrating thing about Forever 21 is that items sell out really fast. To find the best items, check new arrivals daily. The really good stuff only lasts for an average of 2 days. 3. Check online quantities. Want to make an online purchase, but need more time to make a decision? You can check how many are left in stock by adding 20 (the maximum quantity) to your bag. If it says out of stock, then there are less than 20 remaining and so I wouldn't wait much longer to order. You can also see the exact number that are in stock by selecting quantities until it no longer says "out of stock." 4. Return whenever you want. Forever 21 does not offer refunds (they only give you store credit). They also don't take returns after 21 days. But what you might not know is that you can get around store policy by EXCHANGING (not returning) an item whenever you want as long as the tag is still attached. (one exception: jewelry is final sale) This is NOT the official return policy!! But if it's 6 months later and the tags are attached - take it to the store and make an exchange without the receipt, I've done it many times! Update 5/16/12 - While I personally haven't shopped much at Forever 21 over the past year, I have heard numerous reports from readers that their return policy has changed. This little exchange trick I used to do was never the official policy, however, it sounds like they are cracking down now and this trick has not been working lately. 5. Check for quality. Forever 21 offers shirts and dresses that are 100% silk for under $35. These higher-quality items have a special tag that specifies 100% silk and are the ones to go for, since other stores charge at least $80 for a silk tank top! 6. Compare prices. Don't fall victim to the mentality that just because you are in Forever 21, all of the prices are great. They seriously overcharge on some items - so take a second and think about the item you are purchasing to make sure it's worth what they are asking. Occasion: Lunch date, shooting promos for my upcoming show on Izon Orlando! 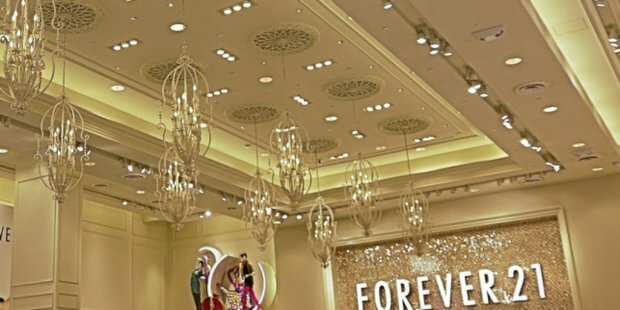 Forever 21 is an American chain of clothing retailers with branches in major cities in the United States, Puerto Rico, Canada, Europe, Asia, in the future Latin America, and the Middle East that offers trendy clothing and accessories for young women, men, and girls at affordable prices.